The comfortable and affordable Braille display. 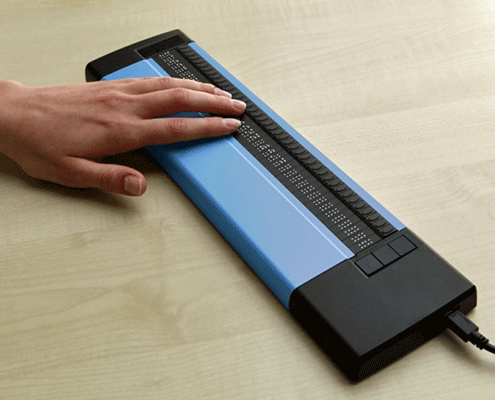 The mobile Braille display Basic Braille is equipped with 40 Braille elements as standard. 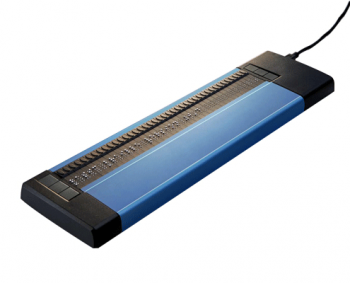 Optionally, it is also available with 20, 32, 48, 64, 80 or 84 Braille cells. With the Basic Braille, you get a low-cost entry-level model in the Handy Tech braille series from Help Tech, in high quality, Made in Germany“. The casing body of the Basic Braille is made of sturdy, anodized Aluminum. The side panels are made of a high-quality, textured, pleasant non-slip plastic. Equipped with durable Braille elements with robust tactile pins. The Basic Braille will provide you access to computer systems for many years. There are only 3 keys to the right and left side of the Braille elements, which does make handling the Basic Braille very easy and straight forward. While you use one hand to navigate you can use the other to read on the Braille display. The cursor routing keys are integrated in the Braille elements and can be used to position the cursor at a desired position within the text. The Basic Braille’s flexible design made it possible to create various versions that cover a wide range of possible applications. The 40-Braille-elements version, for example, is ideal to be used with a laptop computer and the 64-Braille-element version fits perfect to a standard computer keyboard. The Basic Braille is also available with 20, 32, 48, 80 or 84 Braille elements. All versions do have a flat design and can be comfortably placed in front of a computer keyboard or laptop. The Basic Braille is optionally available with wireless Bluetooth connection technology. This version allows you to also use the Basic Braille with portable devices, such as mobile phones, tablet PCs and iPhones. It is equipped with a high-performance lithium-ion battery, which is recharged via the USB connector. You can charge the Basic Braille using a standard Micro-USB mobile phone adapter, or the charging plug included in the scope of supplies.